The internal organs of the human body are encased in a protective sac called the mesothelium. 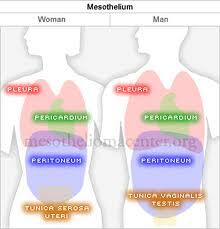 Examples of mesothelilial membranes are the peritoneum (abdominal organs), pleura (lungs), and pericardium (heart). Under specific conditions, the cells of the protective membrane divide uncontrolled and become cancerous. This disease is termed as Mesothelioma, a rare form of cancer which is caused by prolonged exposure to asbestos dust. The disease is found to occur among those who work in shipyards, asbestos mines and factories, industries that produce asbestos based products, and the heating and construction businesses. Approximately 3,000 cases occur each year in the US, and most patients are between 50-70 years old. Statistics show that males are commonly affected and among them whites more than African Americans. • Epithelioid, accounting for 50-70% of mesotheliomas. • Sarcomatoid, accounting for 7-20%. • Mixed or bi-phasic, accounting for 20-35%. When asbestos fibers are breathed into the lungs they travel through large air passages to reach the smaller passages and from them the pleura. In the pleura they damage: the mesothelial cells leading to cancer; lung tissue causing lung cancer; and the development of scar tissue within the lungs known as asbestosis. When asbestos fibers are swallowed they reach the abdominal cavity and cause peritoneal mesothelioma. • Chest pain accompanied by tightness believed to be caused by accumulation of fluid in the pleura. • Swelling of face and arms. • Weight loss that is unexplained. • Problems with blood clotting. Since the above are common to minor ailments, patients often ignore the symptoms. It is advisable to consult a doctor if any of the above symptoms persist or if you feel you have been knowingly or unknowingly exposed to asbestos. • Take down a detailed medical history and try and determine the symptoms and risk factors. o Pleural effusion, fluid accumulated in the chest cavity. o Fluid in the abdominal cavity. o Pericardial effusion, fluid in the lining of the heart. 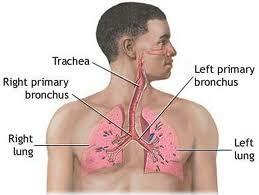 • Take a chest x-ray and check for thickening of the pleura, calcifications, and lowered lung fissures. • Ask for a CT scan to determine clearly the location, size, and extent of the problem if any is suspected. • Recommend tests of tissue samples and pleural fluids. Other risk factors are cigarette or cigar smoking, exposure to radiation, exposure to zeolite a compound that is similar to asbestos, exposure to or infections caused by SV40, a Simian virus. Those who work in a risky environment should wear protective clothing, have the surroundings tested regularly for suspended asbestos particles, and ensure that they have regular medical tests and report to the doctor any ailments that persist. Being aware of the disease and its problems helps.